Right-handed pitching prospect Mitch McKown improved a lot with the Bluefield Blue Jays in 2017. Pitching in 25 1/3 innings with Bluefield; McKown only allowed 10 earned runs, and held opposing hitters to just a .198 mark against him. His success in the bullpen was a welcoming sign, as McKown struggled in the GCL in 2016. McKown credits his better numbers in Bluefield to the coaching he received with the Blue Jays’ advanced-rookie ball affiliate. Another component to his success was McKown’s increased confidence when walking out to the mound. Continuing to sharpen and develop his three pitches will be one of the areas McKown will be working on in upcoming seasons. Currently using a mix of a fastball, curveball, and changeup; McKown discusses how he tries to get his fastball and curveball on the same plain. Mastering his pitches will be a major focal point next season for McKown; who is focused on cutting down on his walk totals in 2018. 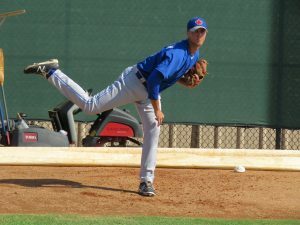 Toronto Blue Jays fans will be following Mitch McKown, as he continues to improve his game next season and for years to come.